40% of all Hurricanes hit Florida, as reported by The Hurricane Research Division of the National Oceanic and Atmospheric Administration. Since Hurricane data started being recorded in 1851, Florida averages tropical cyclonic activity about once per year. There have been 97 major hurricanes since then, 88% of which have hit either Florida or Texas. Miami. Miami has been hit with 31 hurricanes while Naples, on the opposite coast, has seen its share with the landfall of 20 hurricanes. Aside from the Bahamas and Cape Hatteras in North Carolina, there is no greater “Hurricane Hub” than Florida. The peninsula makes the Sunshine State prone to hurricanes from east and west. Forecast cones, school and work cancellations, and brave meteorologists are pretty much an annual factor from the Keys to the Panhandle. To decide on the criteria as to what makes a hurricane one of the worst, there are several factors to be considered. 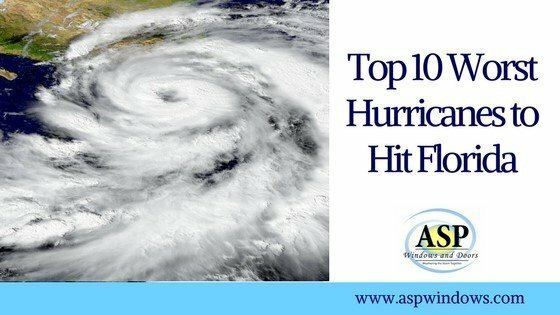 Hurricane deaths are often the first place to go, but loss of life during these events is often attributed to insufficient infrastructure as well as poor preparation. Wind strength, category and storm surges are other factors, but they don’t directly correlate with the worst in damages. The most damaging and deadly storms of all time have hit Florida, but not at their strongest. For that reason, we’ve disqualified Hurricane Katrina, Camille, and the 1780 San Calixto Storm that killed 27,000 people. With considerate attention to these factors here are the worst storms to have hit Florida. In 1960, Donna became the 5th strongest hurricane to hit the United States. Considering the deadly storms that had already hit the US, such as the Great Galveston Storm, that’s saying a lot. Donna left South Florida ravaged by 150 mph winds and an average 11-foot storm surge upon landfall. Donna’s most impactful highlight includes washing a 104-foot freighter onto an island. 857 homes in Miami-Dade were destroyed. The storm would go on to hit every state on the east coast from South Carolina to New York and New England as a category 2 storm. Rhode Island received wind gusts of 130 mph while Long Island was caught in an eye that was 100 miles wide. Considering this was a time where it wasn’t uncommon to go outside during an eye thinking everything was okay, that’s serious business. Considered the hurricane that doomed the first settlements of Florida, the 1559 Pensacola Bay hurricane ruined Spain’s attempt to establish the first European colony in America. The storm went on for 24 hours, taking the 1,500 settlers by surprise. The force and surge caused many of the sailing vessels to break from their anchors and float freely, eventually falling to the bottom of the ocean. Spain would not return until 1698. Because of Katrina and the other major storms, not to mention so many hurricanes that we ran out of names, the 2005 hurricane season often overshadows the 2004 season. While nowhere near as deadly or potent as 2005 was for the United States, 2004 was an absolute nightmare for Florida. Three storms hit Florida in a very short span of 2 months, Charlie, Frances, and Jeanne. It seemed that each one went to pick up the pieces of where the other’s eye missed. Charlie hit Florida as a Category 4, absolutely demolishing the west coast of our state. The storm just barely missed Tampa Bay, which was in the center of the cone. Fort Myers, Naples and virtually all Southwest Florida witnessed its worst damage in over 40 years. While the east coast was mostly spared, Jeanne and Frances picked up where Charley left off. The other issue with consecutive hurricanes is the challenge it puts on relief efforts. It can take longer to recover from storms and get power back when workers are focusing on the effects of another storm. While Hurricane Katrina had hit South Florida around 2 months earlier, it left a humanitarian crisis in New Orleans due to their failed infrastructure. This made it the deadliest US hurricane in over 75 years. Wilma did serious damage to Florida, making landfall as a Category 3 and giving South Florida a Halloween that would be celebrated by candlelight and chasing FPL trucks. With emergency services extended toward Katrina’s recovery efforts, residents in South Florida were left without power for weeks. Broward County had been hit by 27 hurricanes since 1851, but Wilma was the absolute worst for this area. 5,111 homes were left uninhabitable and commercial buildings suffered significant damage including the Broward County Courthouse which remained closed for two weeks. While the world watched the crisis with Katrina, Wilma left South Florida in the dark for quite some time. Still considered the 2nd deadliest hurricane to hit Florida, the 1919 Florida Keys Hurricane is a monster that only affected Biscayne Bay and the Keys before setting course to hit Galveston 18 years after the deadliest Hurricane in American history landed there. While the storm was mostly in the water, it gave maritime enthusiasts a lesson they’ll never forget. 10 ships and 17 houseboats wandering the Florida Straights and Florida Keys were sunk, killing 500 of the estimated 900 people that died in the storm. Having survived the storm at the age of 6, Robert Simpson was inspired to study meteorology and become the first director of the National Hurricane Research Project while also serving as director of the National Hurricane Center. His legacy lives today as the co-developer and publisher of the Saffir-Simpson scale in 1973. ASP Windows can install your impact doors in Miami today. Make sure to check our blog for part two of our countdown.